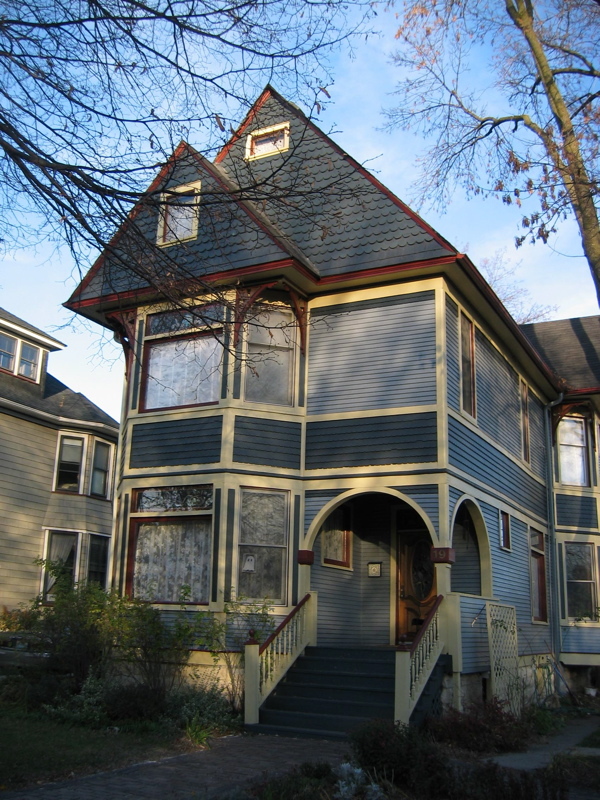 After we decided to sell our place on Howe, we bought our house on Kensington in the inner suburbs of Chicago. 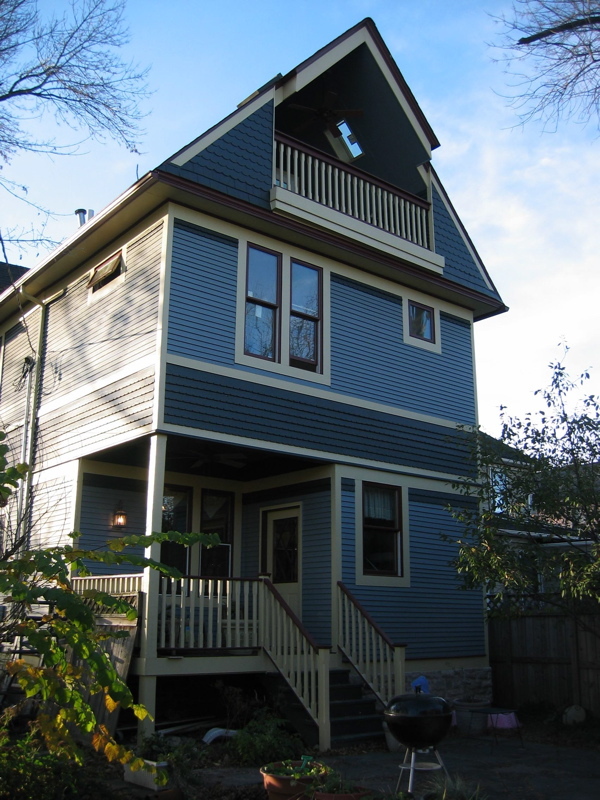 It’s Stick construction, with a Queen Anne-like porch, and an Eastlake staircase. Because I can’t find most of my photos (packed up somewhere), I’ll give you more interior details later. We fell in love with the front staircase. It was the best Eastlake one I’ve seen. (Although the Anderson mansionÂ in Carlinville, Illinois was close.) The front stairs had a hand rail that was curved to match your hand grip (instead of being round or oval), and Jenny Lind like balusters, with trefoils along the top, just under the hand rail. (Who knew there were Jenny Lind musk melons?) A pain to dust, but beautiful with Christmas garlands. Under the stairs were built-in drawers with ornate bin pulls and a coat closet with original wallpaper. The oak pocket doors worked. The dining room was big enough. We had a stair hall. And a parlor with a bay window. The upstairs had quartersawn oak flooring. Our bedroom had a bay window and a little sitting room. The dining room and the guest room also had bay windows. Oak trim downstairs, pine up. Original hardware. Walk-up attic. And the stained glass was wonderful. We had at least four stained glass windows. It was a perfect Christmas house. However, the kitchen was worn out and so stupidly arrangedÂ that the fridge door opened into the stove — which had electric eyes that tilted to the extent that scrambling eggs was difficult. The downdraft exhaust didn’t.Â It had approximately zero linear feet of counterspace, and it was dark to begin with, and it didn’t help that the sole light source was a tiny chandelier with blue shades on the candle lights to block any light it might manage to produce. There were 1.5 bathrooms, and the only full bathroom had a slippery slipper tub on a small ledge four inches up from the rest of the bathroom. (Nearly lost both my husband and my father when the tub threw them out. At separate times. They weren’t bathing together. I promise.) A beautiful, comfortable tub, but a horrible shower. Especially before we removed all the draperies surrounding itÂ andÂ shortened the shower liner that was covering half the floor of the tub. Our bedroom was the only one with a closet (although it was a walk-in closet), andÂ had a vinyl wallpaper that had brown spatters on it. (I worried a little that they might be old blood stains. )Â Our roll down shades were rotten. And, when we moved in, there was old cat poop in the draperies in the sitting room.Â Ick.Â Â We were the house nearest the tracks so we couldn’t sleep with our windows open. The back stairs were dark, steep, and without a hand rail.Â All the sort of things that can come with an old house. So we wound up putting on an addition, adding two bedrooms, a full bath, a functioning kitchen with a pantry, and making plans (with our architect) for a master suite in the walk-up attic, but we sold before we got upstairs — a story for another day. It was allegedly built in 1893* — probably by Franklin D. Cossitt, the man responsible for developing most of La Grange. It was a rent house for much of its early life. One of its former tenants was with his family on the EastlandÂ when it went down July 24, 1915 and 844 excursionists died. He and his family survived. (There were a lot of people from La Grange on the Eastland because Western Electric (the sponsor of the boat trip) was located in nearby Cicero. **) Even after it was no longer a rental, it had a high turnover of owners. We were the third in probably five years when we moved in. *I suspect it was built earlier because Eastlake/Stick style was out of fashion by 1893. (1870-1890 is the usual range of dates I’ve seen.) From what I’ve seen, 1893 seems to be the default date for Realtors’ listings in the area. ** We just saw a local production of Guys and Dolls, and learned that Big Jule, the visiting gangster from Chicago, was from Cicero.Â Small world.